Working with the Blackfeet Nation, I met person after person able to share fascinating stories and insights. The story I thought I was going up there to find morphed and grew and before I knew it I had far too many characters and angles and details fighting for space in a finite Word document. Drafting an outline makes it all feel a little more manageable. Writers have various ways of setting themselves up for the big venture into a first draft of a feature story. Most people I’ve talked to have some sort of outline system they employ, generally with personalized touches. It can be a messy, frustrating process. In the past, I’ve typed out the main points I want to make in the order I plan on making them, with brief notes about which sources and what information to bring in where. I type it at the top of my draft document and leave it there, deleting bits as I write them out. This is sometimes preceded by a handwritten version on a piece of notebook paper or a collection of my favorite office supply, sticky notes. Nothing fancy. This time, that wasn’t really cutting it for me. I’d transcribed hours of interviews, I read all the documents that sources recommended and I’d organized all of my files. I had approximately 28,000 words of interview notes staring me down, patiently waiting to be distilled into a story of approximately 1/14th that length. It was daunting, to say the least. Then, in the midst of outlining attempts, I moved into a new apartment that just happens to feature the most magical writing tool I’ve ever encountered. On one of my walls, there’s a four by five-foot blackboard-bulletin board combo bolted to the wall. When I first saw it, I thought, “Huh. Kinda strange.” Then I realized how fabulous it was. Soon after moving in, while sitting in a camp chair at my makeshift desk, I decided to take a break from the scary number of files on my laptop to doodle on the blackboard. Before I knew it, I had a functional outline scrawled across the board and blue chalk on my face. Colorful patches of sticky notes have since bloomed all over the cork. In retrospect, the reason why the board is so life changing seems obvious. This is a bigger story than I’ve worked on in the past—I needed far more space than usual to arrange my thoughts. It’s like being able to spill my brain out in front of me and move around all the puzzle pieces. 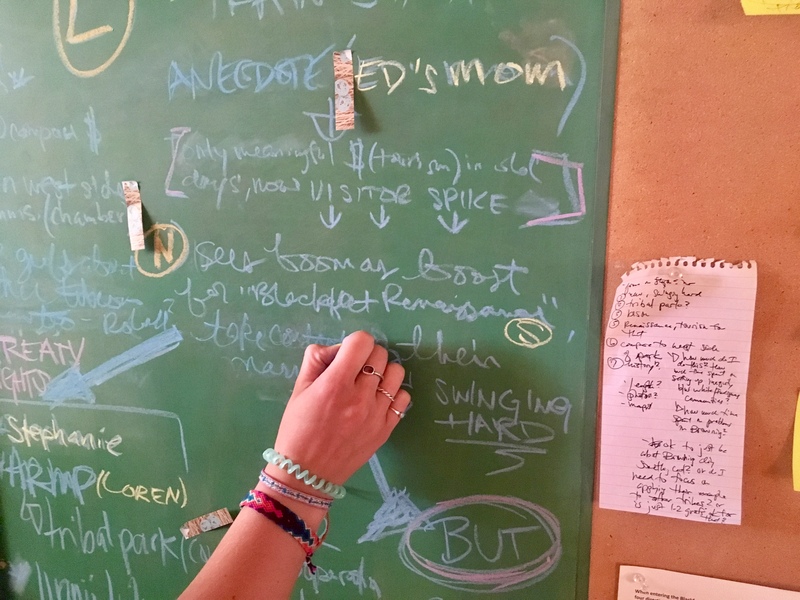 I can color-code to my mildly obsessive heart’s content and each time I look at what I’ve created on that board, I feel a little more at ease with how tourists and train stations, campgrounds, cultural differences and bison will all fit together. Honestly, now I have no idea how I ever got anything done without a blackboard. Put simply, I’m smitten. Consider this blog post a love letter. I’ll keep scribbling and tacking and shuffling until I’m done writing. Until then, you can safely assume I’ll be pacing around my kitchen, staring at a board that’s starting to resemble a wall in the office of a TV detective who’s just about to solve an elaborate mystery. Samantha Weber is a graduate student in the Environmental Science and Natural Resource Journalism master’s program at the University of Montana School of Journalism. She’s a reporting fellow with the Crown Reporting Project, which seeks to inform public understanding of landscape-level conservation, conflicting demands for natural resources and community efforts to build climate resilience. Students head into the field backed by a mentor — a veteran journalist familiar with their area of work. The Crown Reporting Project bridges journalism, science, policy and conservation, helping students develop specialized expertise that can lead to careers in science or environmental journalism. We are gearing up for another great year at the J-School. Classes start Aug. 27, but that’s not the only way to get the semester kicked off. Here are a few opportunities to get to know the J-School as you get started. Come visit the school, meet some of your professors and see where you’ll be making all the media magic happen while you’re here. Wednesday, Aug. 29, 5:30 p.m.
We’ll celebrate the convocation of the academic year with the whole UM campus, but we also have a special kick-off at the J-School, which we call “J-Con.” At J-Con, you’ll get a chance to use the equipment and studios and get to know your classmates and work on projects with your professors. Plus: Free food! If you’re just starting in the program, we asked alums and professionals via Facebook to offer some advice on how to make the best of your time here. Let curiosity lead you, and truth be your final goal!